On Tuesday, May 24th, Auburn School students with good behavior were rewarded the opportunity to celebrate the end of the year with a SWORD Award Carnival. Students were able to spend their SWORD Awards for time in the Bouce House, Bungee Races, Colored Hair Spray, Temporary Tattoos, Face Painting, Ring Toss, Balloons, Bubbles, Basketball Toss, Keychains, Fingernail Painting, Various Concessions, and more. 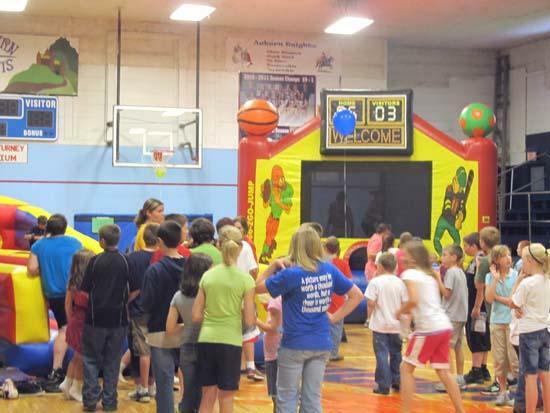 This is the second year Auburn School has held the carnival. Auburn Knights who show positive behavior always Show respect, Work hard, are On time, Responsible, & Dependable.